Cambodian opposition leader Kem Sokha was recently arrested on charges of treason. While the Western media has attempted to portray the charges as politically motivated, Sokha’s treason is not only quite real, he openly, eagerly bragged about it on the Australian-based “Cambodia Broadcasting Network” (CBN). And, the USA that has assisted me, they asked me to take the model from Yugoslavia, Serbia, where they can change the dictator Slobodan Milosevic,” he continues, referring to the former Serbian and Yugoslavian leader who resigned amid popular protests following disputed elections, and died while on trial for war crimes. Sokha is referring to the openly admitted US-engineered regime change mechanism known as “color revolutions” and in particular the successful overthrow of Serbian leader Slobodan Milosevic in 2000. It is also mentioned in the article that Sokha has traveled to the United States every year since 1993 to “learn about the democratization process.” A video of Kem Sokha with US Senator Ed Royce in Washington DC openly calling for the deposing of the Cambodian government has also been published by CBN. As admitted by the New York Times in its article, “Who Really Brought Down Milosevic,” the United States, not the people of Serbia, overthrew the Serbian government – not in favor of the Serbs’ best interests, but for Washington’s own self-serving interests. The successful overthrow of the Serbian government by agents working on behalf of Washington served as a template for other, similar operations including the 2011 “Arab Spring” that has left North Africa and much of the Middle East ravaged by war, failed states, and human catastrophe. Those participating in overthrowing their nation’s government with foreign aid are by definition traitors – and with Cambodia’s Kem Sokha and his entire Cambodia National Rescue Party (CNRP) implicated in and admitting to an identically foreign-organized conspiracy against their own nation as took place in Serbia and across the Arab World, it seems that charges of treason are more than warranted. Readers should take note that nations targeted by US-engineered regime change – from Serbia to Ukraine, to Georgia, Libya, Syria, Afghanistan, Iraq, and Yemen – all have suffered immeasurably since. For the Cambodian government not to follow through with uprooting Sokha and the US networks built up across Cambodia to support foreign subversion, would be the height of irresponsibility, inviting nothing less than the same sort of destabilization and destruction in Cambodia still unfolding in other nations targeted by US political interference. 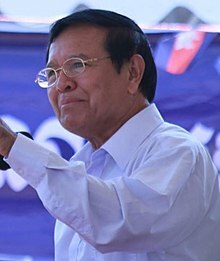 Kem Sokha’s eagerness to indenture himself – and were he come to power, his entire nation – to US interests is perhaps the greatest indicator that he in no way represents the sort of democratic progress he claims to be bringing to Cambodia. Democracy – a process primarily of self-determination – cannot exist if Cambodia’s future is being openly determined in Washington D.C. instead. This article was originally published by Land Destroyer Report.